British royals Prince William and Harry walked the red carpet at the European premiere of 'Star Wars: The Last Jedi' on Tuesday. 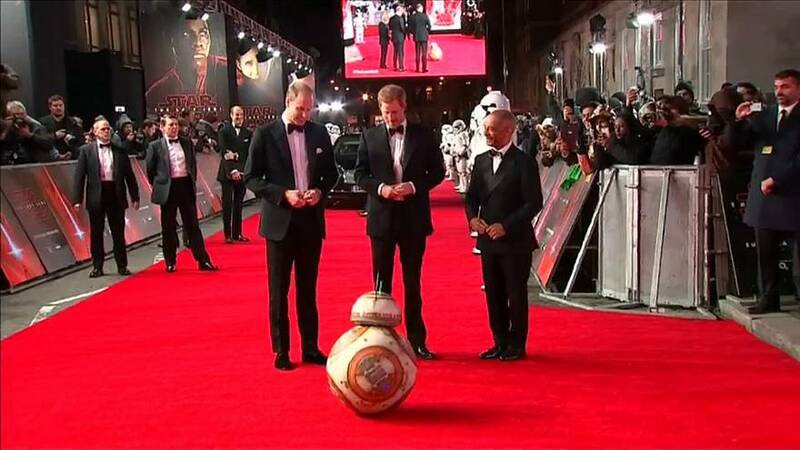 The princes were greeted by the droid BB-8 before meeting the film's cast backstage at the Royal Albert Hall in London. The lead stars of 'The Last Jedi' were all in attendance with John Boyega, who plays rebel fighter Finn, claiming this is the most action-packed and emotional 'Star Wars' movie to date. Boyega even claimed Prince Harry is a 'Jedi' following rumours he and his brother, William, play a minor role in the film as stormtroopers. Newcomer Kelly Marie Tran, who plays another rebel fighter Rose Tico, also said the movie is 'pretty incredible' and couldn't disguise her excitement at meeting the UK royals, joking that she hoped she didn't trip over in front of them. Mark Hamill, who plays Luke Skywalker, Daisy Ridley, Benicio Del Toro, Andy Serkis and Adam Driver were also in attendance at the premiere delighting scores of fans who had braved the cold weather to see some of their favourite characters in person. The film picks up where the last movie 'The Force Awakens' ended with Ridley's mysterious character Rey confronting the original trilogy's Luke Skywalker (Hamill). 'Star Wars: The Last Jedi' goes on release in the U.S. and UK on December 15.